May 28, 2014 by Elizabeth S.
My husband really likes this clock because he can see what time it is. Love the detail on the side. Fabulous piece!! 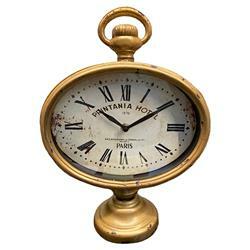 With Roman numerals, a distressed face and a sturdy rustic finished metal encasement, this French Country inspired table clock is enough to make any Francophile go in search of lost time. Undeniably nostalgic and definitely charming, this time piece also embraces modern convenience, operating on one AA battery.